Our Grange(St. George Maine) is hosting a Bean Supper on Saturday, November 10, 2018. 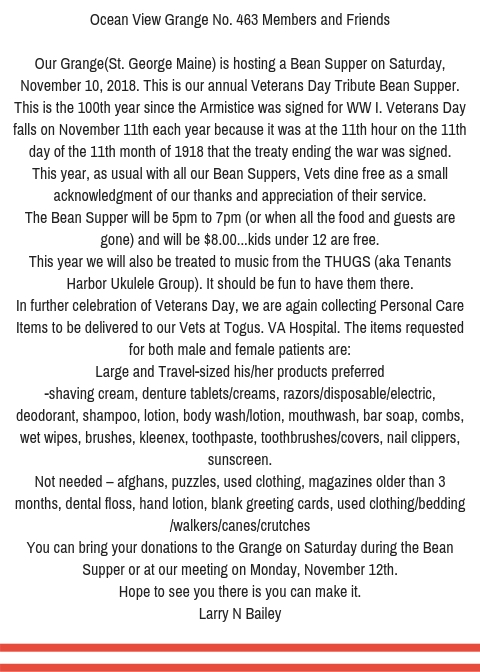 This is our annual Veterans Day Tribute Bean Supper. This is the 100th year since the Armistice was signed for WW I. Veterans Day falls on November 11th each year because it was at the 11th hour on the 11th day of the 11th month of 1918 that the treaty ending the war was signed. This year, as usual with all our Bean Suppers, Vets dine free as a small acknowledgment of our thanks and appreciation of their service. The Bean Supper will be 5pm to 7pm (or when all the food and guests are gone) and will be $8.00…kids under 12 are free. This year we will also be treated to music from the THUGS (aka Tenants Harbor Ukulele Group). It should be fun to have them there. You can bring your donations to the Grange on Saturday during the Bean Supper or at our meeting on Monday, November 12th. Hope to see you there is you can make it.